Sukarni "Karni" Ilyas (born in Bukittinggi, West Sumatra, 25 September 1952) is an Indonesian journalist. Karni is a graduate of the Faculty of Law University of Indonesia. Karni Ilyas, began his career as a newspaper reporter AFP in 1972. He then moved to Tempo Magazine in 1978, until the magazine's New Order government dibreidel on June 21, 1994. His last position Karni, Managing Editor oversees Rubric which, among other laws. Therefore, natural that almost all legal issues in the republic is not separated from record Karni. 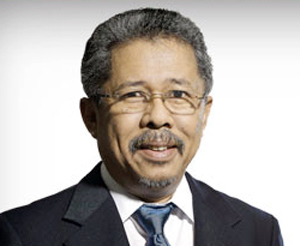 In 1991 he was entrusted with leading legal magazine Justice Forum to 1999 as Chief Editor (with stay on as executive editor of Tempo Magazine). Forum magazine had become a reference that legal practitioners and decision makers related to legal issues. Karni incised critical notes on legal matters through the rubric of homeland Legal Note (already recorded). Came the era of television. Karni left the print media to switch to electronic media, SCTV. He is believed to lead Coverage 6 SCTV (1999-2005). Apparently, in this television Karni discovered the new world that was extraordinary for him. He was encouraged when dealing with the news that deadline could occur at any time. This new world of jargon that makes it have the power of television is speed, speed, and speed. In just six years, Karni managed to deliver Coverage 6 SCTV became the leading news program in the country. Karni then moved to the quiz in 2005. Thanks to the cold hand, a lot of impressions and exclusive coverage of the birth of kewartawanannya acumen. Although his tenure Chief Editor, Karni did not hesitate to go to the field mingling with junior reporter. Karni also managed to sniff at the same time reported that the terrorist leader Dr raid. Azahari in Malang. In 2007, Karni believed to fix the AFP had just taken over the Bakrie family. In the television station was originally named Lativi, Karni served as the Director or the Chief Editor of Preaching and sports news. Not easy to change the image into television news. But then again, Karni Ilyas proved his talents. Within a year, the AFP was able to stand up and be counted as a leading news network in the country. Even the AFP has been recognized as well as the number one TV election. Karni also managed to shed the myth that the news is not synonymous with a frown. He is an information that can be served by pulling so nice to watch while sipping a cup of coffee. Bang One is a figure described by Karni caricatures / cartoons. This character was born in March 2008, shortly after the appearance of AFP. During the year these characters stuck in the AFP news programs (morning news, afternoon, and evening) and got a good appreciation. As a straightforward and critical journalists, Bang One is given the opportunity to guide an interactive talk show titled Bang One Show. In one interview, Bang One often criticized government policies. Karni journalists active in various organizations. He also became President of the Jakarta Lawyers Club, Chairman of ATVSI (Association of Indonesian Private TV), as well as members of the National Police Commission.